STUNNING 5BR, 4.5BA home in Longwood Estates features an attached 3-car garage, and over 4600 sq ft of finished living space. Fall in love from the moment you walk into the welcoming Front Porch & Entry Foyer. Beautiful Living Rm w/ coffered ceiling, recessed lighting, & gas fireplace. Gourmet Kitchen w/ granite counters, custom cabinetry, double sink, tile backsplash, recessed lighting, breakfast bar, & dining area with access to the back patio. Formal Dining Rm w/ wonderful natural light, picture frame built ins, & decorative wainscoting. Master Bedroom w/ coffered ceiling, large walk in closet, & spa-like Master Bath w/ double sink, Jacuzzi tub, & walk in tiled shower. Study w/ French door entry, Half Bath, & Laundry finish 1st floor. 3 spacious 2nd level Bedrooms. 2 Bedrooms (each w/ individual vanity & closet) share a Jack & Jill bath & the 3rd Bedroom has an attached Full Bath. See supplement! 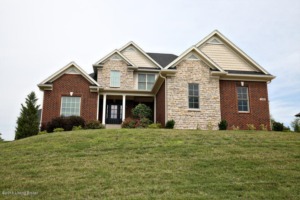 Basement includes comfortable Family Room, Bedroom, Full Bath, & fabulous Media Room. Basement is ready for a full service bar. Covered back patio w/ recessed lighting & ceiling fan. Upgraded 5-4-3 solid hardwood flooring, 8" crown molding throughout 1st floor, upgraded 6" baseboards. Custom trim work includes fluted door casings & decorative corner blocks in baseboards.2 furnaces (upper & lower level). Ideal location close to schools, shopping, & dining. Click to schedule your showing of this gorgeous home.